Meet Agent Nova Forrester. She's a Stabber pilot on a journey. And hers is a true hero's journey. 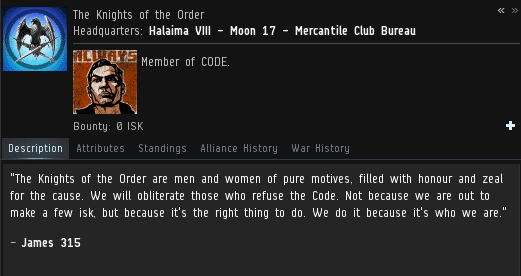 The Test of Fortitude is not often invoked, but it's in the Code, so obviously it's still important. The Knights of the Order corp challenges its members to spend three consecutive hours bumping miners and report back on what they've learned. Nova made a pilgrimage to the historic Kamio system. Since its ice anomaly had not respawned, she checked the system's asteroid belts. 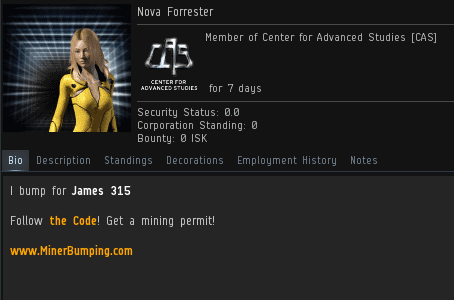 There she found miners who needed bumping. As is usually the case, miners who got bumped started to run away and dock up: Where bumpers go, gankers are likely to follow. 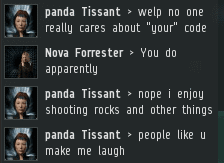 But that didn't stop the miners from running their mouths in local chat. Nova intuited a sense of disquiet in panda Tissant. 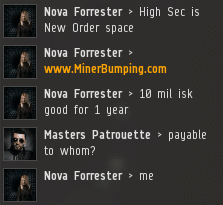 When Nova name-dropped the Saviour of Highsec, the truth came to the surface. 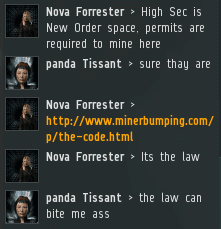 panda was a troubled miner. 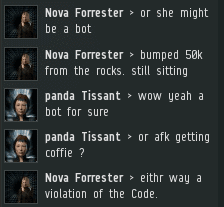 Agent Nova supplied panda with some basic information about EVE as she looked for miners in the other asteroid belts. 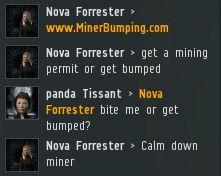 Not all miners docked up after being bumped. Some floated in space, far from the asteroids. They were AFK. The AFK miners and bots were dead to the world. 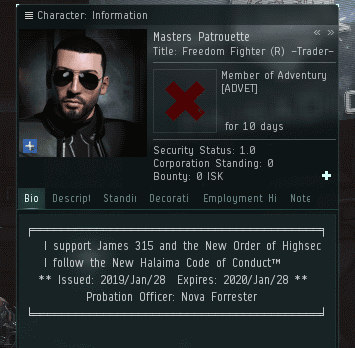 They disgraced themselves and highsec, but at least they no longer gathered ore.
Masters Patrouette feigned ignorance--or perhaps he was completely oblivious to the world around him. Regardless, he could claim ignorance no more. 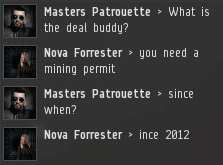 How do you handle a miner like Masters Patrouette? You tell him the truth. Then it's up to him to do the right thing. It was as simple as that. Nova's fortitude was already paying off. Smart miners always recognize a wise investment opportunity. *yawn* Pretty much more recycled, probably made up "content" that Jamey just regurgitates using different names and screenshots. He truly is getting lazy, and his chode. slave continue to lap it up. Chodeanon, we hear your desperate pleas for help, and we've organized a search and rescue mission. 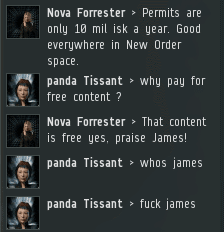 I got 20 bucks on him being an alpha clone in a tanked venture in 0.9 +. Rust is a broken game nobody plays. You are here daily because you have failed eve. Put the leesh back on, realise we own you and buy another barge. I like it when you deliberately wait to reply as to not give away the fact you refresh the comments section every minute. It must be like acid in your mouth not being able to instantly reply in the comments section. That is some A grade mental retardation. Kenny still tryin to be Allah. I hope this series will adequately demonstrate the beauties of bumping miners. 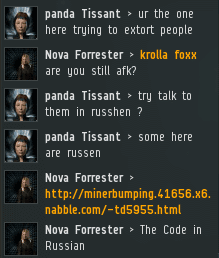 I fear I may lose EvE, grab an alpha Stabber and start bumping too by the time this ends. By the way.. Agents, what are your favorite minerbumping posts about bumping miners? Is your game ending Kenny? It's good training, get them bumping miners now with their scouts, eventually it'll be orcas and freighters. It also helps us distinguish those who are worthy of knighthood. Kenny is so salty over miners. Why do insects make Kenny cry so much? Let us step back in time, a time when the game was in my opinion, healthy. Many of you need no explanation as to why ag and carebears come here to cry daily, but for those who might still wonder why people murder their spouses and get autistic over failure in a video game it is over nothing more than a pre ocupation with greed. Here friends we have a link to the past that shows the depths of what people will do for that poker machine pull of the greed wheel. If only the sohkar recordings were still up. Never underestimate what you can get a greedy miner to do in this game. I prefer to put a leesh on them personally and make them work for my benefit, some like to see how good they can make them sing. At the end of the day they come here daily to cry about the factual truth they are owned by a superior playerbase and they are impotent to do anything but sing like an obese jukebox on teamspeak at our command. It really is a gift that keeps on giving. Bring back the bonus room. Stop projecting and keep crying daily. The Code Always Wins! Always. Kenny you need to relax. Too much salt is bad for you Kenny. Yeah Kenny is really salty. Kenny should play a game more his speed.